This page is about the Russian fighter Yak-1. For later versions, see Yak-1B and Yak-1B (Germany). The Yak-1 is a rank I Russian fighter with a battle rating of 2.3 (AB/RB) and 2.7 (SB). It was introduced in Update 1.43. The Yak-1 is a fairly good turn fighter. Although not as good as Spitfires around the same BR, it is better than some of the German aircraft. The aircraft has good diving speed and energy retention, however, without slats, it cannot out-turn a 109 F in a vertical loop. This aircraft performs best at medium-low altitudes. Due to its small wings and poor rate of climb at higher altitudes, it lacks as a high altitude fighter. The aircraft can be used in horizontal turn fighter, one must be careful to be on the lookout for Boom & Zoomers. If the situation gets worse, a possible escape can be flying low level at high speed or trying an energy-retaining climb. While this aircraft should not be wasted on a ground attack, as last resort it can be used to destroy unarmoured ground targets if the last flying opponent happens to be running away. The aircraft does perform well at lower speeds, yet it becomes most vulnerable to most enemy aircraft including biplanes. Used well, the Yak-1 can be an unstoppable flying machine. Two of the most important things a Yak-1 pilot should aim for are the opponent's cockpit (pilot sniping) or wings. These are typically the weakest spots of an aircraft where a good shot can knock-out the enemy pilot or snap off a wing with a few well-placed rounds. The ShVAK is a fantastic weapon 20 mm cannon if the pilot's aim is good! This cannon has an excellent rate of fire, unfortunately, it is paired with a barely adequate amount of ammunition which can be used up quickly. Mounted alongside the ShVAK are two 7.62 ShKAS machine guns. Much like the cannon, the machine guns do not have a large ammo pool to draw from. Yak-1 pilots always need to be mindful on how much ammo remains after an encounter or risk being pounced on by more manoeuvrable enemies when out of ammunition (or reloading in AB). An Achilles Heel of the Yak-1 is that it lacks armour protection. Head-on attacks from an enemy risk the pilot being knocked out by flying rounds or the water coolant radiator being hit. With a leaking water radiator, the Yak-1 will suffer engine failure with in a few minutes (in RB mode). The engine of the Yak-1, like most Russian fighter engines, tends to overheat quickly and stays running hot. One way to combat overheating is to run the engine at 97% of maximum and limiting usage of WEP. If the aircraft is damaged, the Yak-1 pilot can check the cockpit’s instrument panel (refer to the instrument panel image above) and observe the oil temperature gauge as this will give a more accurate state of the engine than the water temperature gauge. Due to the Yak-1’s manoeuvrability and armament, the main role will be employed as a fighter in the game. The Yak-1 can be used as a turn fighter (see next section for aircraft to avoid while turn fighting), boom & zoom and energy fighting. The Yak-1 performs well in the mid to lower altitudes but loses mobility in the higher altitudes. Ground attack: This should be avoided due to low speeds needed allowing the Yak-1 to become an easy target for enemy aircraft (especially biplanes). Bomber hunting: This is a risky option as bombers typically fly in the higher altitudes where the Yak-1 starts losing its manoeuvrability. The lack of armour on the Yak-1 makes it vulnerable to turret gunners and it is very easy to lose the pilot, engine or a wing to them. 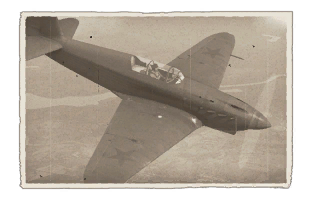 When hunting bombers, the Yak-1 can utilize a head-on approach going for the pilots (pilot sniping) or the engines; otherwise employ the speed of the Yak-1 by diving from a higher altitude towards the front of the bomber aiming for the cockpit, engine or wings. If failing to destroy the bomber on the first pass, exercise patience and set up for another diving pass, any other way the Yak-1 risks bleeding crucial speed in making a quick turn in an attempt to finish off the bomber. Here, quick turns will expose the Yak-1 to any turrets on the plane which would otherwise have a very difficult time acquire a firing solution on a zooming fighter which is quickly out of their range. Spitfires: The Spitfire's superior turning ability gives it an edge over the Yak-1's manoeuvrability. Turn fighting against a Spitfire is very difficult in a Yak-1's, usually resulting in the Yak-1 being unable to shake or outrun the Spitfire. Baring any mistakes made by the Spitfire pilot, the Yak-1 will have a very difficult time gaining an advantage or escaping. A6M Zeroes: Much like the Spitfires, the A6M Zeros are superior turn fighters and have the added bonus of being armed with 20 mm auto cannons giving the Japanese fighter a firepower boost against the Yak-1. When attacking in a Spitfire or A6M Zero, engage in a turn fight, bait the Yak-1 into tight turns to bleed its speed. Bait the Yak-1 to higher altitudes, the higher it goes, the less manoeuvrable it becomes and the more limited their options become. 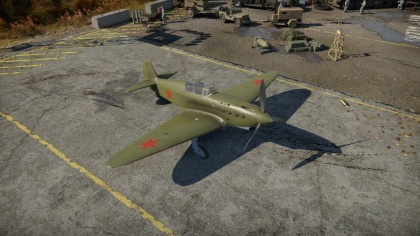 The Yak-1 does not have any armour plates in the front and is susceptible to pilot sniping, wing snapping, engine/fuel tank fires and overheating with a few well-placed shots from cannons or machine guns. Non-turn fighting aircraft should rely on Boom & Zoom tactics in an attempt to take out a Yak-1. A drastic speed reduction and turn in hopes of an overshoot. Keep moving around so the Yak-1 cannot get acquire a firing solution with its cannon, causing the Yak-1 to expend all of its rounds (in AB this then gives a ~40-second window to attempt to get away or reverse roles before the Yak-1 cannon has reloaded). Drag the Yak-1 back towards teammates and set the Yak-1 up to be an easy target for comrades to take out. Powerful cannon with limited ammo/dual machine guns with an adequate amount of ammo. Good top speed at low altitudes. Even though its frame is constructed of wood, the Yak can take a lot of punishment and still perform well. No armour to protect the pilot from the front, engine or fuel tanks, almost doomed if set on fire. In 1939 the Soviet Command was looking for a replacement for their outdated I-153 Chaikas and I-16 Ishaks. Jakovlev was part of a Soviet delegation on a visit to the German aviation industry in October 1939. His interest was in aerodynamic design and during a visit at Heinkel, their new radiator lacking He 100 fighter was shown to them. Three (or ten) vehicles were bought by the CCCP. While the He 100 was producing record level top speeds, the surface cooling technology and other handling characteristics tainted the aircraft with the Soviets and were marked unsuitable, like in Germany. Already by January 1940 a first prototype was ready for taking off. Baptized I-26 (Istrebitel -> Fighter), the test flights were marked by a horrible accident as Julian I. Piontkowski, a test pilot for every Yakovlev plane, crashed and died. Fortunately for the plane's designers, the aircraft's construction was not found to be the cause of the accident and state supervised tests continued until November 1940. Serial production subsequently started in December 1940 under the new designation "Yak-1". By the time of the German invasion, all of the new fighters were delegated to the defence of Moscow, as was the MiG-3. War Thunder Forum Development Announcement: "[In Development] Yak-1"
↑ 1.0 1.1 1.2 German Wikipedia, figuratively translated, From the German Wikipedia Yak-1 article. The text was figuratively translated. This page was last edited on 8 April 2019, at 10:30.